LOVE IT! I donated money on behalf of my parents and brother to the children’s homes I support in Bolivia. Then in turn my dad donated money on behalf of his siblings and mom too! The kids in Bolivia need the money so much more than I do and I love that after I did this on behalf of my parents two years in a row they continued the tradition! We gave away Christmas this year, but just a little differently. We live on a very tight budget but I had set aside a specific amount to spend on each of my 2 daughters. We have an out of state friend with 4 children, who had a recent and unexpected move, and therefore had no Christmas money for her own small children. My daughters asked me to use their gift money to send her a Target gift card, instead of buying them gifts. It was selfless and lovely act and actually made our Christmas better. We felt purpose and happiness in helping another family. So now we’ve decided to adopt a family every year and keep our own Christmas down to one gift a piece. We have enough stuff and this helps us keep sight of why we celebrate Christmas in the first place. Oh how I long for simpler more Christ centered Christmases and LIFE for that matter. I love that you did this. We’ve not been able to completely forgo the gifts yet but each Christmas we spend as much on ourselves as we do on a needy family anonymously. We find out details about their needs and some of their wants, especially the kiddos and we pack a big box with a Christmas feast and one with gifts and often a third with household essentials and clothes if needed then we (or someone else) deliver it and in our small town we can still do the ding dong ditch ’em. It’s a blast and the memory outlast our stockings and 3 gifts on Christmas morning. We include a letter about Christ’s love and our reason for doing this tradition and we always include a copy of our favorite Christmas book “The Greatest Christmas Pageant Ever” which keeps the kids on the edge of their seat wondering who’s going to burn down the barn or run away with the cake next. Thanks for this post! I’m sharing it. A couple of years ago, the kids voted to give the money we would have spent on one of their presents to someone from our church going to visit orphanages in another country. The money went to the kids. We didn’t give up our whole Christmas, but they really did get one less gift then we usually buy. We do this every year. We don’t ask people to make donations in our names. However, we don’t by Christmas gifts for anyone. We exchange stockings and that’s it. For us, Christmas is not about getting gifts– it’s about sharing his love with others in need. Instead we do random acts of kindness and each family member picks someone to bless anonymously. It might be someone in our neighborhood, the school secretary or someone going through cancer treatments. We leave the gift on their doorstep with a anonymous note (usually including this: : http://www.skywriting.net/inspirational/poems/santas_secret.html) and we are on our way. In our house, we only get gifts on our birthday. It works for us! I like the idea! One gift is usually enough to keep young kids entertained anyway. Too many gifts is overwhelming. We started giving away Christmas several years ago. We had previously asked our families to give to charities on our behalf and it was not honored. We still got stuff we didn’t want/ couldn’t use. So we opted out of Christmas giving all together. We give to an orphanage in Romania and to Gospel for Asia year round as well as other Christian groups who do good work. My in-laws still give up a gift (but much less than previous) and we don’t visit when they are having their to-do (partly because of the gifts and partly because of dh’s work schedule). My fmaily does not give us a gift and we also are unable to visit on Christmas but often see them a few days later at an extended family gathering. Giving all that up was great! No extra shopping or gift-making; no wrapping and hauling. Just a pleasant remembrance of Jesus’ birth. Best of all, no huge boxes of things we didn’t want to try to find a home for, exchange or take to the thrift shop. I know everyone is going to think I am horrible! I just don’t think that putting that idea ( an adult decision) on a child is right! No matter how much your child “says” they understand, they are just children and all too often people forget that. There are memories and impressions to be made all the time, but taking Christmas away is just not right. I just don’t agree. Although your generosity does not go unnoticed. I don’t think your horrible at all. It’s an extreme decision (and very generous one). While the children may be learning a very valuable lesson, many adults I know are shaped by what they found lacking in their childhood. So I worry when kids live through extremes, they often emerge on the other side of the extreme. So a child who is given nothing becomes the adult who can’t stop buying presents. That’s just my experience though, I don’t know this family. I felt the same way when I read this. We strive to give to others all year, but also enjoying giving within our family, following the three gift concept as we give to our children (one toy, and 2 handmade, useful, or needed gifts.) I could see them giving up these three gifts, but Santa would not stand them up! Yes, I have to agree. I think it is asking an awful lot of children to expect them to give this up. I was thinking the same exact thing as you when I was reading all of these comments. I think it sounds amazing in theory and is definitely very selfless and kind, but I could never and would never expect my children to do that. My daughter is just a child and for her to give up her Christmas so another child can have what she deserves is just too much. My husband and I work very hard to ensure we provide our daughter with everything she wants and needs — yes, I know wants are not needs, but she’s our child and we want her to have it all! Sounds selfish maybe, but its the truth. We always donate to charities throughout the year and every Christmas we give to a needy family, but that does not affect anything that my daughter does / doesn’t receive because of this. She will help us pick out presents for the other children, but she knows she too will be getting presents. It just doesn’t seem fair to deprive your own children of Christmas when you are turning around and giving Christmas to other children. I do not think you are horrible. Giving needs to be a decision made on your own from the heart. A child or teen (or adult for that matter) being told they are not getting gifts because they are giving them to others does nothing to foster the true meaning of giving . You can tell them all you want; but if they don’t embrace it in their heart it means nothing. Take them to a nursing home to play with some adoptive grandparents, help them ring the salvation army bell, have them spend their money to buy the items for operation Christmas Child box if they want to donate something (don’t make them), help them serve at food bank, if they are older send them on a mission trip to see real need….there are so many options and they can do them all year long. If they want to give up their Christmas gifts that is one thing but I would think that would come after years of watching Mom and/or Dad do that not after having it declared on them. And I think it is horrible to tell grandparents and family and friends who want and wish to bless your children with gifts that they can’t. That is a blessing you are robbing the giver and the receiver of. My in-laws are wonderful generous people who model giving throughout the year to multiple organizations (churches, missions, schools etc) they volunteer their time at various other organizations as well including my own children’s school and I would never dream of telling them that they could not give my children gifts. They love giving to others but also love BLESSING their own grandchildren. I hope my children never rob me of that blessing when I become a grandparent. No, Christmas is not about stuff for anyone rich or poor, it’s about Jesus. No one said that you need to spend thousands of dollars on your kids for Christmas however nothing seems very extreme. All or nothing always are. 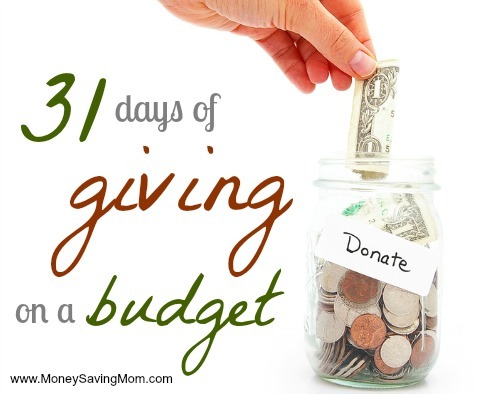 A budget in which you donate plus your children still get gifts works for us. Our children have never been forced to donate however donate regularly on their own and give up things for others and would never hesitate to help others in need. I hope that this strategy works for this family and teaches the generosity that they desire to teach. Completely agree, and you aren’t horrible at all. I think the concept of scaling back and not taking gift giving/spending to the extreme is a wonderful one! And so is charity and teaching the the TRUE meaning of Christmas. My son is almost 3, and I think I maintained a healthy balance between the excitement of getting presents, and the blessing of giving. He gave about 20 toys to charity before Christmas, and he didn’t get an overabundance of presents. (a big present and several smaller ones.) We made a birthday cake and card for Jesus, and sang him Happy Birthday. He enjoyed watching others open their presents just as much as opening his own. I think for a 3 year old…that’s a pretty big accomplishment. I wouldn’t ever force giving on my child….that totally forfeits the concept and the results. And, I agree with the comment about a child living through extremes growing up to go to the opposite extreme. There is a balance, and it’s a lot healthier than either extreme. I agree. I think it’s an extreme that may not be the right thing to do for every family, and it may be too much of a burden for young children to understand if they are required to give up Christmas gifts, especially if it’s not their own choice to do so. I would love to stop exchanging gifts with extended family members, but I doubt that they would ever get on board with donating to charity instead. And we have the only kids on my in-laws’ side of the family, so it wouldn’t seem fair to them if they were to buy stuff for the kids, but we didn’t give them anything in return. Still, we try to keep our spending moderate. Our kids each get a certain amount from us to spend on a gift or to give away if they want to, and they get surprises in their stockings on Christmas morning. They are very compassionate and usually choose to donate some of their Christmas money to help other people. After reading some of the comments, I feel that the heart of the blog was missed. Forgive me if I am misreading the hearts of any commenters. It seems as though many read the blog and then launched a platform to defend and justify their methods of giving gifts, missing the point of the blog. This family in the blog felt led by the Lord to make some changes in how they operate. They included their children in their journey of faith and allowed their children to listen, think and understand. I think that “deprived” is a word that none of us able to view the internet or buy gifts at all really know the meaning of. And to speak of what we or our children “deserve” is a slippery slope. Let us remember that God, not focused on what He deserved, was willing to sacrifice and ask His Son to do so as well. It was through suffering that the Author and Perfecter of our faith made our salvation perfect. See Hebrews, chapter 2. Seek God’s heart and He will show you the what, when, where and how of giving for your family. Meanwhile, let’s encourage and cheer on those that are excited about how God is changing the hearts of their families.